A day out in Penzance is always a treat with its mix of architecture and Penlee House Museum and Gallery to enjoy. I still find it being one letter away from spelling ‘penance’ very amusing too! Having had a long train journey due to a breakdown at Devonport (although seeing the old yard and modern ships made it bearable) finding lunch was a priority. Only the coffee to go! After increasingly annoying my hungry friend by turning down several cafes we spotted Archie Brown’s and raced through the shop upstairs to the cafe. For the uninitiated there are two Archie Brown’s and they are a health food shop with a vegetarian cafe above. The other one is in Truro near the Royal Cornwall Museum (which has a fine cafe of its own). We had a good lunch with warming puddings served by friendly staff. 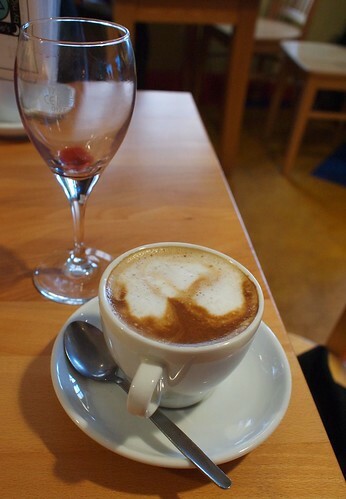 The wine, custard and coffee were particularly remarked on with satisfaction. The service was good and the cafe is one large room with plenty of space and very busy on the weekday we were there.